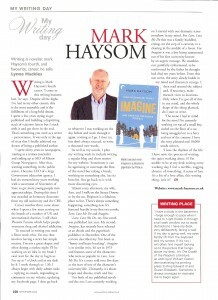 Writing is Mark Haysom’s fourth career. ‘I come to this writing business late,’ he told me. ‘Despite all the highs I’ve had in my other careers, this is the most enjoyable and is the fulfilment of a long-held dream. ‘I spent a few years trying to get published and building a dispiriting stack of rejection letters but I stuck with it and got there in the end. That’s something you need as a writer – perseverance. It was only at the age of 60 that I finally achieved my dream of being a published author. ‘I spent thirty years in newspapers, starting as a trainee journalist and ending up as MD of Mirror Group Newspapers. ‘After that, wanting something in the public sector, I became CEO of a large Government education agency. I had six extraordinary years working with a succession of Secretaries of State to get more young people into apprenticeships. During this time I was awarded an honorary doctorate from my old university and the CBE. ‘Career number three came about when I spent a few years serving on the Boards of a number of UK and international charities. I still chair Phoenix Futures which helps people overcome drug and alcohol addiction. ‘To succeed in writing you need a fierce work ethic. For me, that involves having a strict but simple routine. I’m not a great sleeper and often during a restless night I’ll be working on an idea in my head. ‘I can’t wait for the day to begin so I’m up at 7 o’clock and at my desk by 8. I work through to 1.30. I always begin with daily admin tasks – replying to emails, responding to comments on my website, updating my Facebook page. I then go back to whatever I was working on the day before and work through it again, revising as I go. I then try, but don’t always succeed, to write a thousand new words. ‘As well as my novels, I plan my writing week to include writing a regular blog and short stories for my website. Sometimes it can be agonising to interrupt the flow of the novel but taking a break, working on something else, has its benefits. You go back to it with more discerning eyes. ‘Almost every afternoon, my wife, Ann, and I walk on the Sussex Downs or by the sea. Brighton is a fabulous place to live. There’s always something happening, something new. It’s featured heavily in my first two novels, Love, Love Me Do and Imagine. ‘Love, Love Me Do, my first novel was published last year. 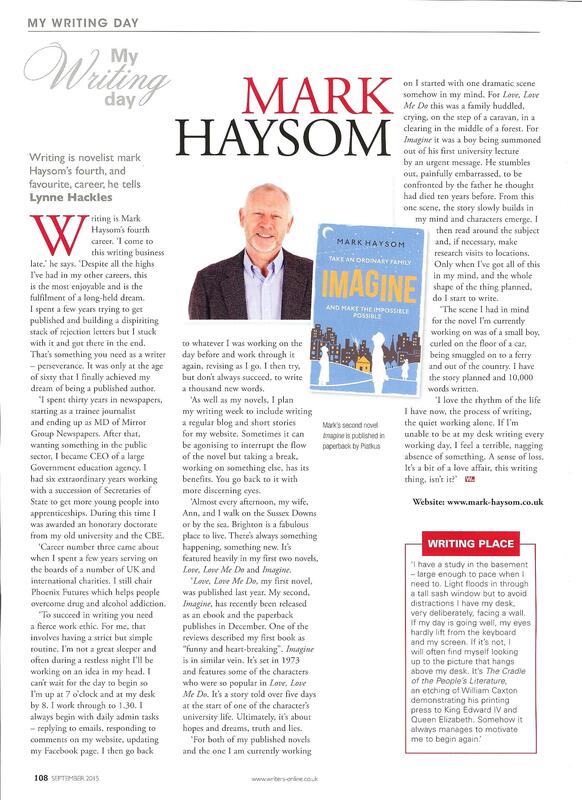 My second, Imagine, has recently been released as an e-book and the paperback publishes in December. ‘One of the reviews described my first book as “funny and heart-breaking”. Imagine is in similar vein. It’s set in 1973 and features some of the characters who were so popular in Love, Love Me Do. It’s a story told over five days at the start of one of the character’s university life. Ultimately, it’s about hopes and dreams, truth and lies. ‘For both of my published novels and the one I am currently working on I started with one dramatic scene somehow in my mind. ‘For Love, Love Me Do this was a family huddled, crying, on the step of a caravan, in a clearing in the middle of a forest. ‘For Imagine it was a boy being summoned out of his first university lecture by an urgent message. He stumbles out, painfully embarrassed, to be confronted by the father he thought had died ten years before. ‘From this one scene, the story slowly builds in my mind and characters emerge. I then read around the subject and, if necessary, make research visits to locations. Only when I’ve got all of this in my mind, and the whole shape of the thing planned, do I start to write. ‘The scene I had in mind for the novel I’m currently working on was of a small boy, curled on the floor of a car, being smuggled on to a ferry and out of the country. I have the story planned and 10,000 words written. ‘I have a study in the basement – large enough to pace when I need to. Light floods in through a tall sash window but to avoid distractions I have my desk, very deliberately, facing a wall. ‘If my day is going well, my eyes hardly lift from the keyboard and my screen. If it’s not, I will often find myself looking up to the picture that hangs above my desk.